Few things are as timeless and classy as pearl jewelry, and a well-chosen pearl accessory is definitely able to lift almost any outfit into a more elegant and refined one. Pearl jewelry has been around for a few centuries, but while previously it was available only for members of the aristocratic class (both men and women) and meant to symbolize their high rank, the 20th century popularized pearls for the general public as well. This was in part a consequence of Mikimoto’s innovation, since this Japanese businessman and visionary was the first to discover how cultures pearls can be produced, making them more affordable. On the other hand, the growing popularity of pearls in the 20th century was also a consequence of Hollywood cinematography and the way all those beautiful and iconic movie stars were wearing them. No one can remain indifferent to the timeless grace and beauty of these iconic women wearing strands of beautiful pearl jewelry. This post will teach you how you too can pull off that look, without making your overall style choice seem inappropriate, tacky or over-doing it. 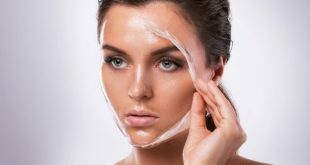 Many contemporary women would love to try the pearl look at least once, but are usually reluctant to it because they realize the high standards which come to accessorizing that look. This is all you need to know about how to pull it off flawlessly. We will start with the basics and then move on to bolder choices, as you become more accustomed to wearing pearls and this type of jewelry becomes part of your style. If you are a beginner when it comes to wearing pearls, you should obviously start with the classic version of this look. Don’t worry about seeming out of fashion: first of all, pearls never go out of fashion, and second of all if you keep the overall outfit as minimalist as possible, it will all be perfectly cool. Here is how to do it. First, choose a simple pearl necklace and matching pearl earrings, of the same light or neutral color. White pearls are classic, but you can also go for something with a tiny bit of color in it, like pink pearls, peachy pearls, white pearls with a strong golden shimmer and so on. Choose whatever you think would favor your complexion and overall style best. It is widely regarded that light-colored pearls and pearl jewelry in general only favor women with very light skin, but this is hardly the truth. Anyone can benefit from the beauty of pearls, since all pearl colors and varieties cast a soft light on the skin of their wearer (more on this later). The light-colored pearl jewelry you choose should only fulfil 2 conditions in order to achieve the classic look presented above: the necklace can be multi-row or single-row, as long as there is no pendant and the pearls look perfectly aligned, and the earrings should be stud-style (even if you go for big pearls like in the picture above). Next, think of adding a few make-up touches to your look in order to achieve that perfection of classic elegance. Red lips are a must if you go for this look, but you can choose any shade of red you fancy. It doesn’t need to be a strong fiery red, you can choose a more demure natural rosewood or burgundy tone, or even use a reddish-toned lip stain or tint. Another must is black eyeliner, and the only prerequisite is for the makeup lines to come in a classic style, so no futuristic double-lined or geometrical styles! Just draw a slightly prolonged black line in the corner of each eye and you’re done. The last ingredient is a shimmery overall impression, with the soft glow of the pearl jewelry you’ll be wearing. Use a face illuminator or glowing complexion enhancer, face primer, skin illuminator etc. and some optional pearly eye shadow, if you want. If you prefer to settle for just the eyeliner for the makeup of your eyes, it’s no problem. A sophisticated jumpsuit made from a quality fabric (think silk or any tight-cut woven fabric – basically anything goes except something too sporty or utility overalls-like). As we mentioned above, the soft shimmer of pearls (also known as nacre) casts a wonderful light on the complexion of whomever wears the pearl jewelry. All pearl colors and varieties will reflect light onto your skin, highlighting its natural beauty and the rest of your features, so you can count on this effect no matter what kind of pearls you choose. However, some pearl colors may be overall better suited to your skin tone than others. This is why you should consider looking into a peach or rose pearl necklace, according to what colors you know suit you best. You can even go for golden pearls or lavender pearls (yes, there is such a beautiful thing!). There are no rules here to follow exactly; this doesn’t have much to do with your skin color and whether it is darker or lighter. 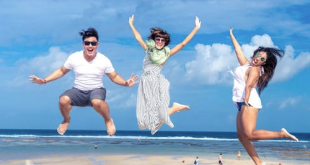 It’s more of a matter of skin color temperature and whether you have warm or cool undertones in your skin; so basically only you can notice what colors suit you best. If you generally tend to look good in lavender tops, then by all means, go for the lavender pearl necklace. If peach tops makes you look peachy and radiant, then choose a peach-colored pearl necklace and you can count on its beautifying properties. Wear your long pearl necklace with a little knot towards its end, which will almost look like a pendant. It’s sophisticated and casually careless at the same time; few ways of wearing your pearl jewelry can be cooler than this! 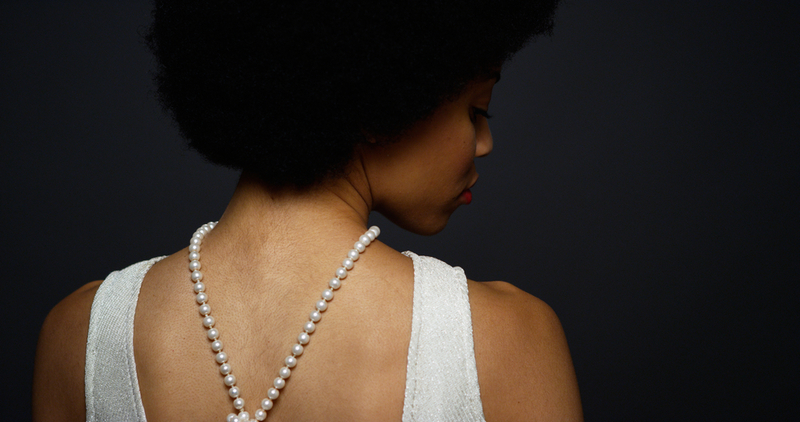 Wear your pearl necklace draping on your back (especially if you are wearing a low scoop back top). You can even do this with the knot detail added towards its end for extra coolness points (like in the picture above). Use a long pearl necklace to wrap it around your wrist multiple times, creating a multi-row rich bracelet. You can also opt for a shorter, simpler, choker-style necklace to go with it, or just let your neck bare. If you have long hair and you like wearing it twisted into a top bun, you can also use your pearl necklace to adorn the hair bun once you fix it tightly in place. When you’re done with the bun, simply wrap your pearl necklace around it several times. See if it fits and thread carefully, don’t pull at the string and don’t use any hair pins to fix it, since this may damage the precious pearls. 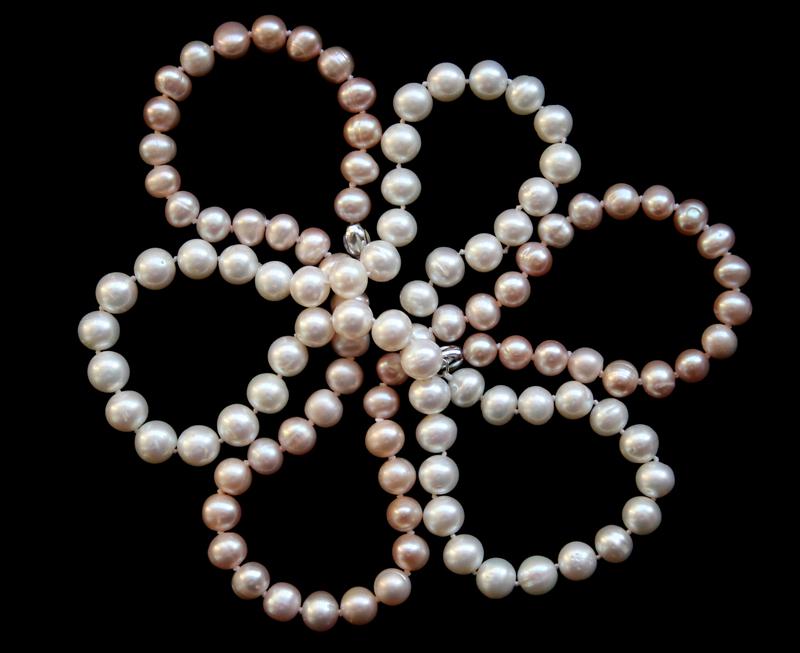 Baroque pearls are natural pearls with varying, irregular sizes and shapes. 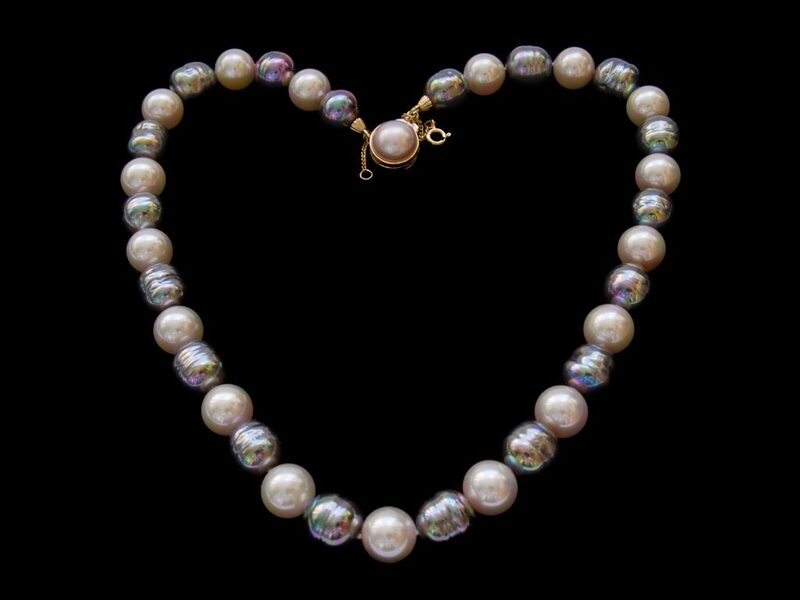 Since natural pearls tend to be rarer and more expensive than cultured pearls, a baroque pearl necklace such as the one featured above is quite a find. Usually, vintage jewelry stores or antique markets are the best place to get your ands onto such a beauty without making a too huge hole in your budget. Creating a harmonious string of pearls using irregular shaped and sized pieces is considered an art form, and there are no 2 strings of baroque pearls alike. 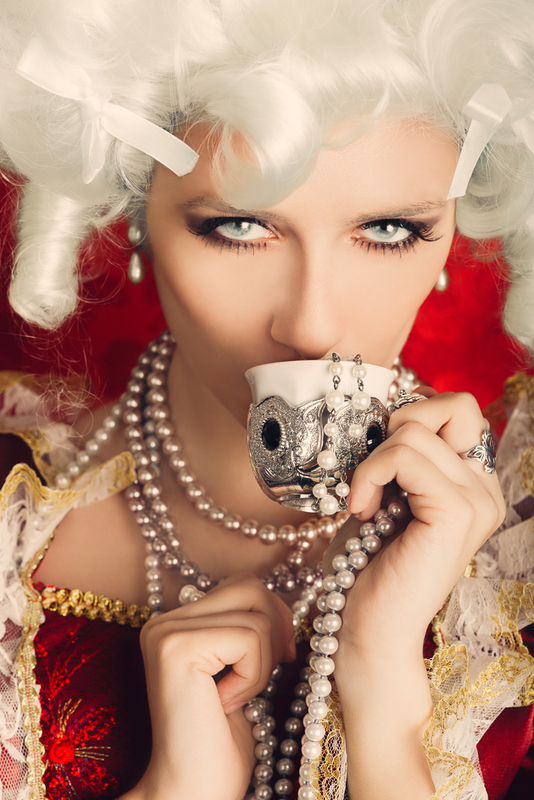 Therefore, if you’d really like to own a unique pearl jewelry piece that looks truly special and highlights just how unique you are as well, consider a baroque necklace. You will have to do a bit of searching and ‘hunting’ before you can find one that truly speaks to your style, but it will be all the more rewarding once you do. Ready for a major twist in your pearl-wearing style? Once you’re perfectly comfortable wearing your light-colored pearl jewelry, it’s time to go for a darker look, one which embodies both a bad girl attitude and perfect elegance at the same time. The unwritten style rule for almost all fashion areas is that when you’re in doubt, return to black as a go-to option. Black is demure and daring, as well as elegant and sophisticated. It manages to draw and not draw attention at the same time. When it comes to pearls, if you choose to go for black ones, they will definitely draw all the attention. Black pearls are so unusual and rare (they can actually only be produced by a type of Tahitian oyster) that any outfit which sports them will be elevated to a pinnacle of sophistication instantly. Also, if you have a slightly more rebellious styles and don’t really fancy pastels and light colors, this style choice is definitely the right one for you. You can find black pearl jewelry in a variety of options, from necklaces to earrings and bracelets and beyond. Don’t hesitate and go for it if you know this choice speaks to your style; your jewelry will be a much welcome dark and exotic addition to it. Ready to go fully wild with your pearl-wearing style yet? We only recommend this look for people who are not beginners in wearing pearl jewelry, since it can be a little hard to pull off at first. But once you’re confident and familiar with various pearl necklaces and tend to wear them on the regular, feel free to indulge. Why not wear them all at once, for instance? You can wear them as multiple rows of variously colored strings on your neck and wrists at the same time. Just make sure the overall assembly doesn’t contain too many colors of opposing tones. For example, if you have various shades of grey, black, white and golden pearls on you, it’s fine; but if you have both lavender, green, peach and various shades of grey pearls, it may be a little too much. Keep the whole outfit classy with minimalist earrings (they should also be pearl-based, preferably) but a bold choice of clothes. Some suggestions that would work wonderfully are these: lace and velvet for the top and a pair of jeans, or a lace or velvet-based dress, or a simple black top and a more heavily embellished or embroidered skirt, or an elegant top plus black leather leggings etc. The overall idea is that your style should be both elegant and rebellious for this multi-layered pearl look to work. Obviously, this is a style better fit for a party than for casual events or for work environments. Once you’ve garnered the confidence to go wild with your pearls, don’t hesitate to try it. The world is your oyster (pun not intended).